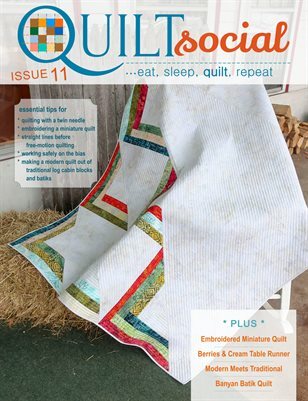 If you're getting bored with the same ol' quilting, this issue is for you! In this extraordinary issue of QUILTsocial, we break a few rules and think outside the quilting box too. Quilting teacher Julie Plotniko, shares tips and her tutorial on everything you wanted to know about the twin needle and what the excitement is about in quilting with a twin needle. Quilter Paul Leger breaks the quilting rules by incorporating Banyan Batiks in his modern quilt design and shows how linear quilting isn't so linear after all. Quilter Christine Baker explores THE Dream Machine 2 and it's embroidery capabilities to make a miniature quilt, seamless and easy, see how she did it! Also included is award winner Claire Haillot's most refreshing table runner pattern for the summer using the PFAFF creative icon. Let's hop to it! Happy Quilting!